Analysts have predicted that accounting will be one of the fastest growing segments of the national economy throughout the next several years. With more than 600 enrolled students each semester, the accounting program at the UH C. T. Bauer College of Business stands to prove those predictions. “This is the finest hour to be in accounting. There is no better time than now to be in the profession,” says Barry Melancon, President and Chief Executive Officer of the American Institute of Certified Public Accountants. Bauer College students seem to agree, as accounting is the largest undergraduate major in the school. Senior Jyoti Sugavanam credits the accounting program at Bauer with helping her secure a prestigious internship with the tax department of PricewaterhouseCoopers, the world’s largest accounting firm. 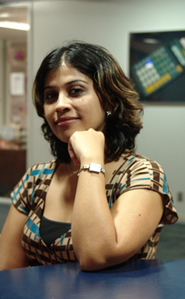 “The accounting courses at Bauer exposed me to different scenarios and to think about them in a deeper manner, beyond making just journal entries,” says Sugavanam, who will receive her second accounting degree from Bauer in December 2008. A native of India, she received a bachelor’s degree in accounting from the University of Bombay in 1999.